December 2  Steak at Vinson Base ! Friday December 2nd has begun as sunny, very calm and clear at Vinson Base camp. Very different from the report I gave you right after we got here yesterday. Last night we sat in a large permanent metal frame tent with a wooden floor that has been here at Vinson Base for years. We sat inside with Margot and we enjoyed macaroni and cheese which has been one of our favorite meals and steak. Just so you’ll remember we are in Antarctica however, we took the temperature while we had the stoves going when we were cooking inside this permanent tent at Vinson Base and it was -18C (0F). It’s still always cold here and when we went out to our North Face tents and got in our big sleeping bags, we were quite warm especially with our hot water bottles that we take to bed with us every night. Today I hope will be the summit day for one team that may well be trying today. I’m looking up at Mount Vinson wishing them well. 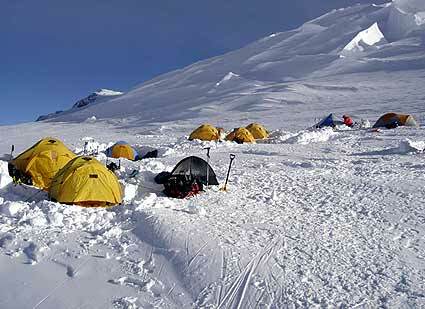 Of course all of our mates, those four teams at Camp 1 I’m sure will be moving up on to the saddle. It looks to me that they might have good weather up there, although it is a long ways away and it’s hard to tell. Woodie, Martin and I have decided that we will not be climbing to the very summit of Carl G. Vinson’s mountain this year. We decided the best thing for our little team to do is stay here at Vinson Base, keep in contact with Patriot Hills about a possible Ilyushin flight coming in from Chile in some time and then the other step of maybe getting twin otters out here so we can begin our journey home. In the meantime the solitude and isolation of Antarctica is all around us. Our team spirit holds us together and we are having a great time just living in a vast, pure and immense wilderness. It’s really a marvelous experience being down here day to day. Before we left Camp 1 Woodie handed off the USS Vinson medallions and some summit flags and other memorabilia to our good friend Jim Gagne to continue on to the summit with. We wish Jim and his teammates the best of luck as they continue to try to reach the top of Antarctica, Vinson Massif.